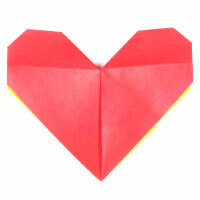 You can learn to make various kinds of origami heart here. There are 2D and 3D heart as well as heart with wings. So make one of these for your special occasion. 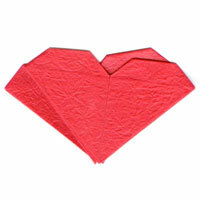 Simple paper heart starts from a half-square paper. One special folding technique that you need to apply for this model is petal-fold. 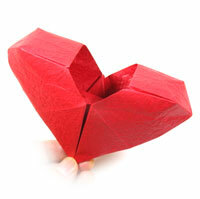 The instruction for folding 3D heart is given here. You can put a chocolate or a ring inside of this heart. The instruction for folding 3D open heart is given here. Since you have an opening on the top, you can put something in this heart and take it out easily without destroying the heart. This might be a good gift for Valentine's Day. 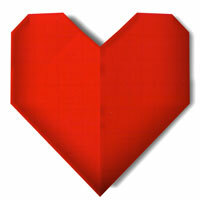 The heart with an arrow is not advised to try for origami novice. Special folding techniques involved with this model are inside-reverse fold, pleat-fold, and squash-fold. 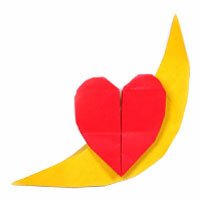 The heart over the moon is not advised to try for origami novice. Special folding techniques involved with this model are Z-fold, swivel-fold, and rabbit ear-fold. 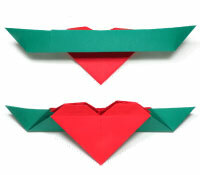 This heart origami boat starts from 4x4 matrix base. The special folding techniques that you need to apply for this model are squash-fold, inside reverse-fold, open sink-fold, closed-open sink-fold, and open-closed sink-fold. 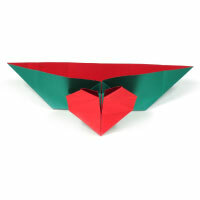 This heart origami boat starts from 6x6 matrix base. 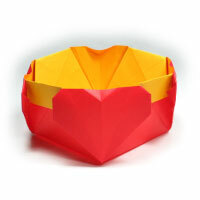 A heart symbol is attached to the outside of this origami boat. There is no special folding technique involved with this model. 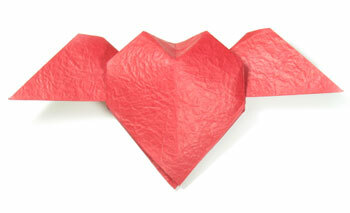 This paper heart is an easy model to fold. One special folding technique you will learn from this model is an inside reverse-fold. This heart is a one-side heart. The other side has a triangular stand. This heart has an heart shape on the front side. On the backside, it has a stand. 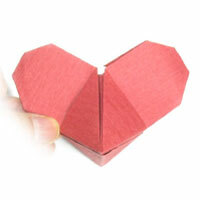 The instruction for folding 2D heart is easier compare to the one for 3D model. 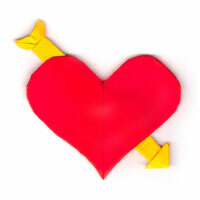 This heart has two hearts attached together. 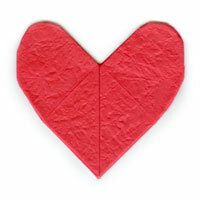 One heart is exactly the same as the the other one in both shape and size. 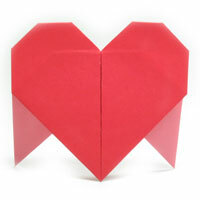 This heart with wings starts with a square base and it takes 43 steps complete. One special folding technique used in thsi model is "tail-fold". The heart with two back legs allow it to stand by itself. There are two special folding techniques that you need to know for this model. They are both square-fold and rabbit ear-fold. This heart has a shape of Mickey Mouse. 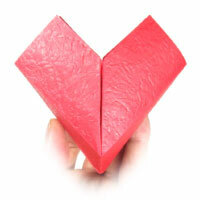 This is 3D heart so that you can put something inside. One special folding technique you need to apply for this model is a closed sink-fold. 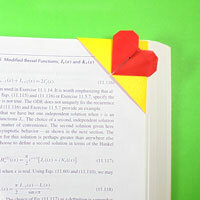 The unique feature of this heart is that it has tiny wings. One special folding technique that you need to know for this model is "inside reverse-fold". 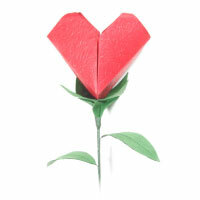 This heart is a flower representing a heart. Here you have a heart flower attached to a wire stem, a calyx, and two leaves. This might be a perfect gift for Valentine's Day. 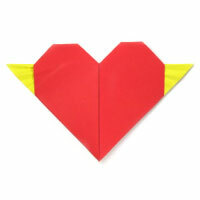 This heart paper plane actually flies. It has the heart symbol at the top of this plane. In this instruction, I make use a square paper. But you can use any rectangular paper such letter or A4 size. 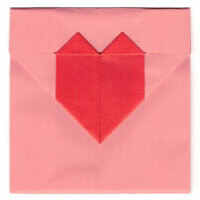 This heart origami envelope has a heart symbol on the back. The special folding techniques involved with this model are both squash-fold and inside reverse-fold. 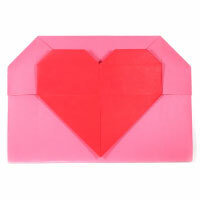 This heart envelope has a heart symbol on the back. It is not difficult to fold this model. One special folding technique that you need to know for this model is swivel-fold. 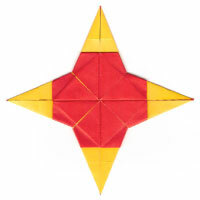 This four-heart star starts with a 8x8 matrix base. Two special folding techniques that you need to apply for this model are both petal-fold and pleat-fold. 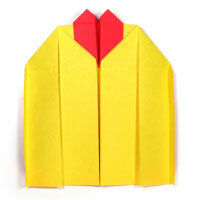 You will also need to apply two kinds of petal-fold here. This heart box has a heart symbol at four corners. 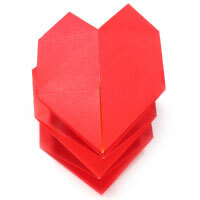 You will be able to make a heart-shape spring. 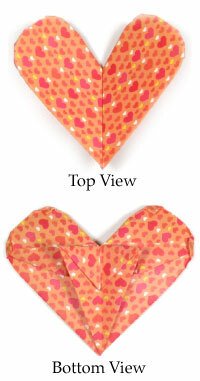 The top-corner heart bookmark is a little tricky to fold if you are a neophyte to origami. Try to learn special folding techniques involved with this model throughly before working on this model. 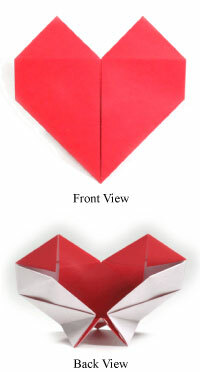 They are kite-fold, balloon-fold, pocket-fold, and reverse swivel-fold. 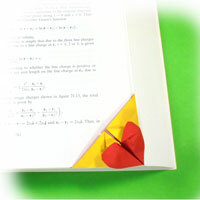 The bottom-corner heart bookmark is a little tricky to fold if you are a neophyte to origami. The most tricky folding technique is involved with flipping a layer after applying a valley-fold. 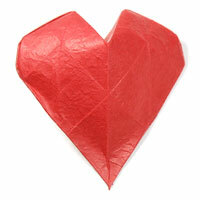 You can easily tear off a typical origami paper. If this is the case, you may better off using a high density paper. 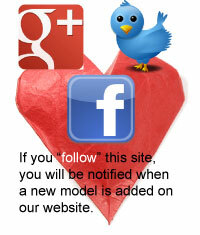 If you want to report any bugs on the pages, please email to me at .